If you’re looking for an enjoyable way to spend this summer, then having fun with your friends and family is indeed in order. And what better way is there to do so than by searching for the freshest water toys this year? We’ve got a list full of recommendations for you, and we’re confident they’ll spice up any pool party. Whether you’re a family man or a party animal, chances are you’ll find something that suits you. An item that could just as quickly fall into the exciting kids toys category, this ball is made of durable PVC and is light enough to be passed up to ten feet. However, once it hits the water, it resembles a watermelon, not only in its appearance but its texture, too. It can be dribbled just like a basketball. This makes for a unique game that you’ll come to enjoy once you get the hang of it. It combines elements from many beloved sports such as rugby or football, and it’s suitable for all the members of the family above the age of eight. If you’re not the athletic type, you can try the more relaxing part of poolside hobbies, which is floating around on a giant floating mat, maybe reading a newspaper or your favorite book, or just browsing on your phone. This model has a new design that will allow just enough water in to keep you cool but will remain above the surface level. You can use it with other floating objects by linking them through the connect ‘N float devices. It’s made of vinyl and measures 114 by 84 inches. It can be easily folded down to a fraction of its size and stored when it’s not used. A water gun that will be just as exciting for adults as it is for children, this summer choice can hold up to 38 oz, only needing a refill every once in a while. The water blaster can target up to about 32 feet away, allowing the real sense of a chase. It’s an excellent alternative for small children as well, given that it doesn’t contain any unsafe materials or tiny parts that they can swallow. What’s more, the manufacturer made sure your money is well invested by protecting this item with a 90-day warranty. You’ll get a refund if anything happens to the device within the first three months. This two-person hammock is an excellent option for cooling down on a hot summer day by floating around the pool alongside a partner. The contour follows the shape of the human body, increasing the users’ comfort. The headrest and footrest are larger than the body of the inflatable mat, and its cool weave fabric allows the temperature of the water to be felt through the material. It has a capacity limit of approximately 250 lbs and it roughly measures 52 by 44 inches. You’ll be able to use this product as a hammock or a drifter, whichever one you prefer. It comes in a few different prints and colors so you can choose the one you like the most. For those who aren’t huge fans of swimming but want to enjoy the pool just as much as the other family members, SplashNet has provided this floating golf mat made of soft foam. It’s a golf course in miniature, featuring two flags, two cups, and twelve practice balls. The main advantage is that you can comfortably seat beneath your fancy beach umbrella and avoid the sun rays while still playing your favorite game since you’re not required to be in the pool. When you’re done playing, you can roll it up and store it due to the softness and flexibility of the foam. There’s no summer fun without water toys. So if you’re searching for some real enjoyment for you and your friends, that’s what you’ve been missing. Trying to find the right toy has never been easy, though. Most people struggle because they can’t really put their finger on what they’re after. We are often limited in our choice of products because we don’t usually have time to read all about them or have a hard time finding out which one suits us better. It’s the same with beach toys. There are tons of new products each year and knowing all about them is both a waste of time and a futile attempt to gather all the information at once. The diversity of ideas and preferences is another obstacle for anyone who’s fond of spending time by the water. It’s a great idea to read the reviews by yourself, but you would probably be overwhelmed. That’s where we can help. We have designed a comprehensive buying guide that covers most of the issues concerning water toys. It’s been written so that buyers of all ages, genders, and styles can find it useful. Skim it to navigate the ocean of products for a successful purchase. First of all, you have to decide what kind of water toy would be better suited to your needs. Depending on where and how you want to use it, you should first choose the type of water toy you’d enjoy. Only then you can start evaluating their features. There are plenty of water toys that can turn the hours spent on the beach into a very engaging and fun activity. The simplest of them have been fun to use ever since you were a kid and the best water toys reviews are still placing them on top. Balls and surfboards will always be around and while you can describe each of them in just a few lines, the things you can do with them seem to be just as entertaining as the latest devices. They’re an easy pick and you can’t really miss. We can put water skippers and handboards on the same list. They’re much more recent, but unless you’re dedicated to traditional water toys, there’s no reason why you shouldn’t enjoy them just as much. In case you’re prone to activities that are less brisk, there’s always a swim ring or floating pad you can hang on to. 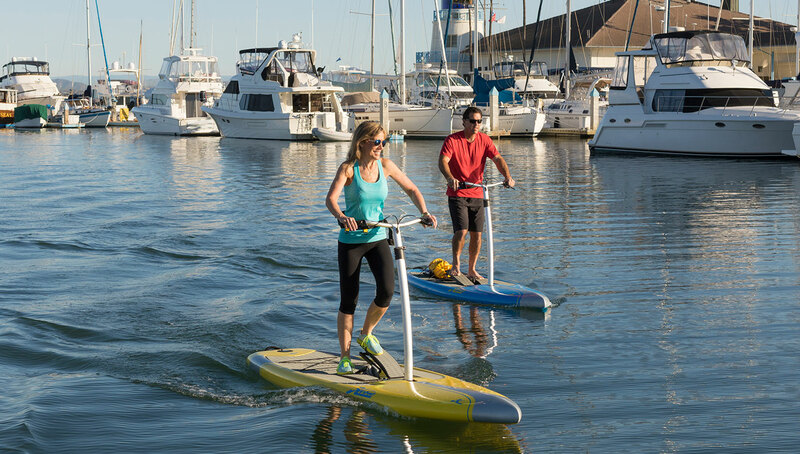 As you’ve noticed, you can buy cool water toys for adults that have no wires, no pedals, and no fiberglass. Many of the things you can use for fun can be made to work just by using your lungs or an air pump. They come with multiple advantages and there’s a million of them for sale, so they should be on your list, too. They vary from classic shapes to the odd and funny ones and you can find them in all sorts of colors. Those of you who only want to relax can pick a mattresses or armchair. Unlike usual mats and chairs, you don’t have to use these only on the beach or by the pool. Most of them are designed to keep you afloat when you want to go in the water. For when you feel like doing more than just sunbathing you can use slides, trampolines or rockers. It’s really easy to install them and everyone can have lots of fun. If you’re a dynamic person or want to become one, then maybe you should place your bet on electrical devices. They usually have high maneuverability and speed and provide plenty of fun for the people that like to relax by using those instead of lazy pool floats. 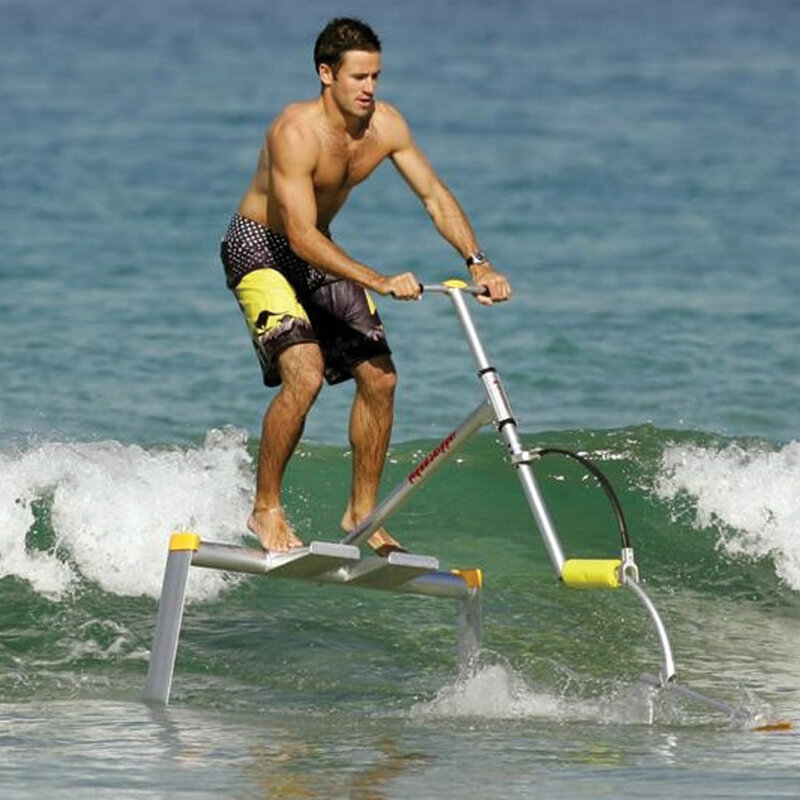 In this category you could include almost anything from small yachts, personal submarines and water propelled jetpacks to motorized surfboards, diving scooters, and remote control boats. Since not everyone can afford a small submarine for their summer holiday, there’s good reason to believe people will prefer more affordable and portable water toys. Small diving devices with a propulsion system have been introduced, and people are delighted as they can use them with or without scuba equipment. Buying more complicated devices is a bit risky because you may find yourself without company. Also, they would need some maintenance and a there is an upkeep cost. While some of the products we buy for the summer days are for our own pleasure, water toys are great for sharing. If you’re not planning on a quiet vacation, having fun on the water side is mostly supposed to happen in groups of people. That’s why you could take a moment to think whether you’re about to purchase something for your own use or try to make it into a party. On the upside of buying for personal use, there are gadgets and toys you’d be happy to have for future events. And there are always products you can buy for group play without an exceeding cost. On the other hand, big toys that require more money and logistics carry the benefit of splitting the costs and multiplying the fun. Some are luckier than others and they get to walk on the beach and swim in the sea. Others will have to improvise. That’s why cool adults water toys are also manufactured for backyard pools. In other words, not all the products that you’ll be hearing about are just as good for sitting by the pool or going to the seaside. If you don’t have enough time or money to go to the ocean side or visit a large lake, it’s ok to limit yourselves to the types of toys that are recommended for the pool goers. Those of you who have set their minds on sending postcards back home should be looking for beach water toys. The range of artifacts you can use at the sea is different. Some are better suited for saltwater and sand. Those used in a pool, for instance, aren’t supposed to withstand powerful waves or strong wind. When you think you’re close to making a decision, don’t forget to balance other factors as well. The material out of which the products are made is important so check to see if there’s anything you should worry about, such as toxic plastics. Features like handles or strings are welcome and finding lightweight items is indicated.